The home of Busega Scotland is Moray, the Scottish county that boasts 50 ‘Speyside’ whisky distilleries. On 3rd October, a bottle of ‘Macallan Valerio Adami 1926’ 60-year-old single malt whisky was sold at auction for a word record price of £848,000. It was described as the ‘holy grail’ for its rarity, vintage and artwork. 200 miles and a world away from the auction room in Edinburgh, Busega Scotland volunteers were making sales of second hand goods in support of Shida, the nine year old girl at Mayega Children’s Centre with serious sight problems. 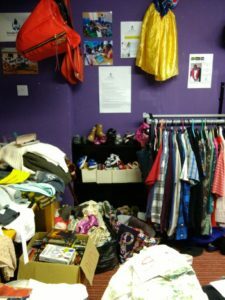 We were joined by a lady called Karen, who had worked in retail, and helped us sort out our jumble of clothes into their various sizes. If you are not careful in our shop, you can transform in an instant from customer to sales assistant! We were happy to help a local nursery school with clothes for a scarecrow; with a ball for a bored kitten and fabric for a dog sofa! Our support for Shida continues. 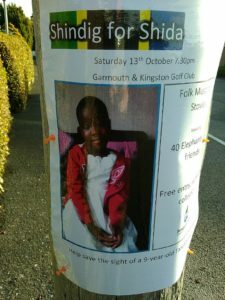 In John and Christine’s home village of Garmouth, there will be a ‘Shindig for Shida’ on Saturday 13th October (with folk music and stovies) starting at 7.30pm (no tickets, just turn up). Stop press: final takings for the Busega Scotland shop totalled £1475. Many thanks to all who made this magnificent total possible.